The Masquerade will be in the Regency Ballroom on the second floor of the Fairmont Hotel. The air-wall that divides the Regency Ballroom into two halves will be in place. The Masquerade will be in one half of the ballroom, while the other half will include the Masquerade Green Room. 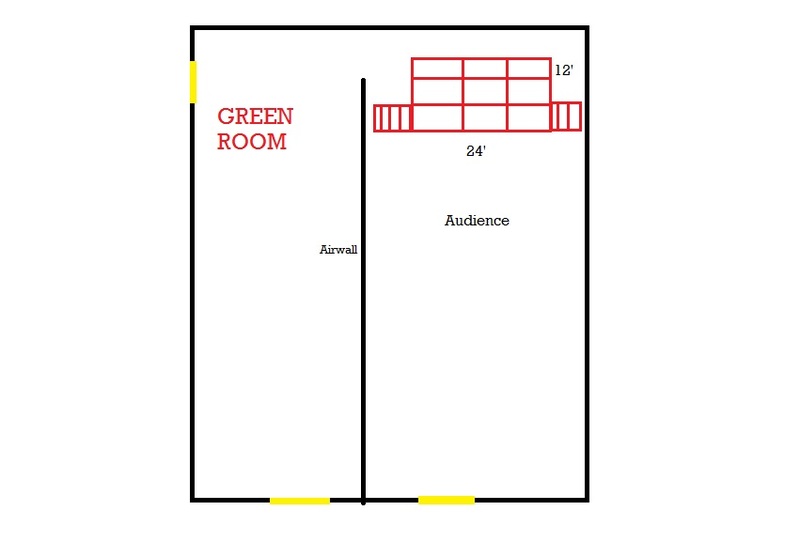 See this sketch of the planned room and stage layout for a more details. The following are important technical concerns for entrants in the Masquerade. There will be NO live mikes on the stage. All sound/music must be pre-recorded and brought by the entrants to the pre-masquerade meeting. Music/soundtracks must be burned on to a CD-ROM in MP3 or WAV format. Also, bring 2 copies of the disc, just in case. Do not bring us a commercial CD with a note along the lines of “Track 3, 45 seconds in, please” because the correct playing of it cannot be guaranteed. Please take the time to edit your music exactly how you want it. Label the disk with your real name, your entry name and a contact phone number (preferably a mobile number). At the Pre-Masquerade Meeting, the Director will collect music/soundtracks from you. Since you’ve brought two copies, hang on to one, and give the other to the Director. The MCs will be willing and able to read out a short piece of commentary/description before and/or during your number, if you wish. There is a section for your script on the MC form. Please print legibly, or type up something ahead of time to attach to the MC form. Pre-printed text (in 14-16 point font) is highly encouraged. In the Green Room, the MCs will check in and meet with all entrants to confirm how to pronounce your name, how you want to be introduced, etc. If you have large props, or a costume that limits your mobility, please bring your own assistants to help you/it/them on and off the stage. Although we will have a limited number of backstage ninjas available, we cannot guarantee they will give you the same level of service your own dedicated crew would give. What are the dimensions of the stage? So… if I have a bit of commentary for my costume, should I pre-record it myself and burn it to a CD, or have the MC do the talking? You can do either one. From a technical standpoint, it’s easier to write down what you want to have the MC say, and it’s something you can easily edit just in case you change your mind.